Whether you're planning to prank your roommate or just want to play a practical joke on your friend, college offers plenty of opportunities to get mischievous. You can even play a well-coordinated prank on a good-natured professor, residence hall supervisor, or other university staff member. It's important to consider safety and the other person's feelings before planning your trick; however, there are lots of great college pranks that are harmless and fun. There are many different pranks that can be successfully staged in a college setting, and the following pranks are harmless. They also have the additional benefit of being easy and affordable, perfect for the college student on a budget. Hold a classmate's or roommate's notes for ransom. Then leave elaborate clues leading them all around campus to recover their work. Leave humorous messages or cartoons on sliding classroom white boards. You can see the effects of this prank if you are able to sneak into the classroom early, and it is particularly effective if you can use tall boards that aren't easily reached to be erased. Buy a universal remote control with a strong range and use it to change channels on televisions in different rooms or lounges without anyone realizing you are behind the prank. Another good option is the TV-B-Gone, a universal remote that will turn off almost any TV. Reset a friend's cell phone ring tone to a seductive or obnoxious tune and call them during a lecture class or while they are in the library or cafeteria. Before conducting this prank, make sure your friend won't get in trouble to disrupting the class, and avoid any days when your friend has an exam. Purchase a bag of white chicken feathers from your craft store and bring them with you to dinner in the cafeteria. Have someone distract a friend who ordered the chicken, and while that person's back is turned, stick a stray feather or two into the meat. For this one, all you need is a few eggs. Ask the victim whether he or she will let you crack three eggs over the top of his or her head for $100. The offer of some cash may tempt the person to agree to your request. Crack two eggs on their head and be sure that the yolk breaks for maximum effect. Coordinate with an entire class to turn in assignments on colored paper. Just make sure your instructor can still read the assignment. Sneak out at night, and use crazy glue to stick a penny to the sidewalk in an area of campus that gets a lot of foot traffic. The next day, find a spot nearby so you can watch how many people try to pick it up. 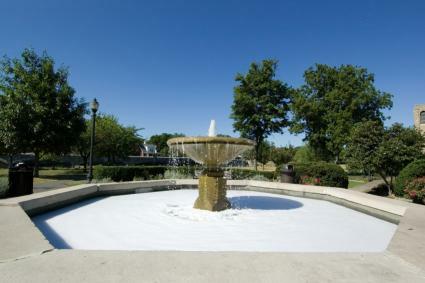 Discreetly add dish soap to a campus fountain for a bubbly prank the entire university will see. Choose biodegradable dish soap to avoid harming nearby plants or the water system. This one will take a bit of time, so you will need to find some time when you aren't likely to be disturbed. Take several spools of thread and some tacks and set up a giant spider web throughout a lecture hall. You can wind it around furniture and other objects to create the desired effect. Then watch and see how people react when they arrive for class. From setting up doorway pranks to playing tricks in the bathroom, there are plenty of harmless dorm room pranks you can try. Just make sure your tricks are fun for everyone involved. Safe and fun pranking is all about considering your audience. Before you begin planning your trick, make sure it's not emotionally or physically harmful to anyone and won't damage school property or get you into trouble with an instructor. If it's harmless, than have fun!